Atlanta, GA, January 3, 2018: Fast-food chain McDonald’s has introduced McAloo Tikki from India at its global headquarters restaurant in Chicago’s West Loop neighborhood. The vegan option is part its international menu which also has favorites from around the world. 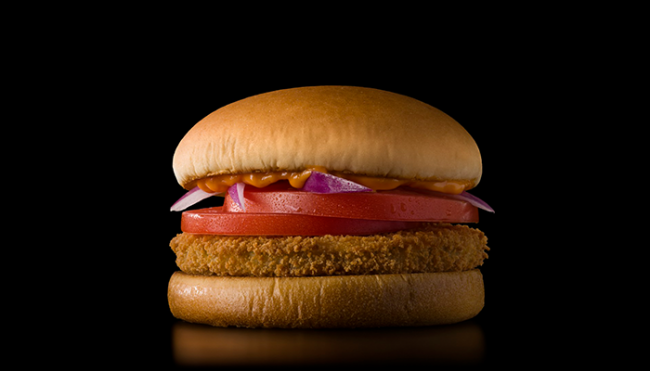 A press release issued by McDonald’s describes the McAloo Tikki as a toasted bun filled with a veggie patty made with potatoes, pea and seasoning reminiscent of samosas; topped with fresh red onions, tomato slices and an eggless creamy tomato mayo. “Customers have expressed interest in items from McDonald’s restaurants located in India and we’re excited to offer them the opportunity to try the long time vegetarian favorite, McAloo Tikki,” said McDonald’s Owner/Operator Nick Karavites. Customers can enjoy new global menu items from India, Australia, Canada, Germany and Hong Kong. The more than 6,000-square-foot restaurant is one of the latest McDonald’s Experience of the Future (EOTF) restaurants designed to dramatically transform the customer experience with modern designs, self-order kiosks, table service, mobile order and payment, McDelivery with Uber Eats and enhanced hospitality. The restaurant also features outdoor seating, and an ever-changing wall map with Golden Arches that illuminate when an item from a specific country is featured on the menu, and An Australian McCafé area serving up expertly brewed coffee crafted by McDonald’s trained baristas.